One of the main cause people don’t cook is that they don’t know how, and don’t know how to find good cooking recipes. 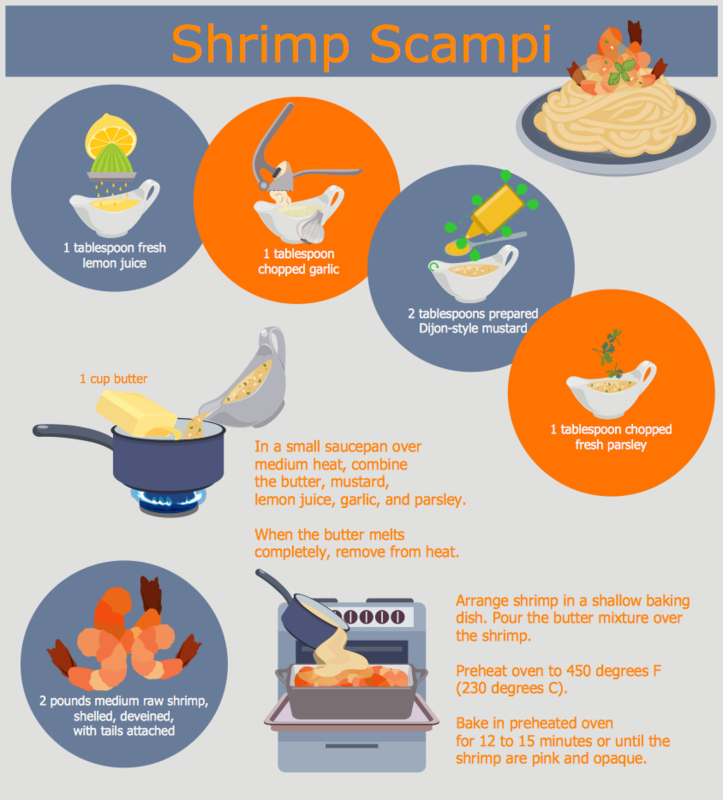 The informative, interesting and well-illustrated infographics will make anyone a good cook. ConceptDraw's Cooking Recipes solution contains a collection of library objects and sample drawings for ConceptDraw DIAGRAM that helps make short work of drawing professional food-related infographics, and visualizing cooking recipes. Open a new ConceptDraw DIAGRAM document and select the Cooking Recipes libraries. Double click on an object’s icon in the library to place it in the center of your document. Also, you can add objects to the drawing by dragging them from the library to the page. Arrange the elements on the page in the desired order using the Arrange&Size panel. Now, you can add some text. Use the Text tool to add your text to the drawing. Select the proper font size and color using the Text Format panel. By dragging the control dots you can regulate the position of your text. Use the Line, and Fill tools to format elements of your drawing. Find them in the Format panel. Finally, you can export your drawing to MS PowerPoint® and Adobe PDF using the Export options from the File menu. Result: Using ConceptDraw’s Cooking Recipes solution you can easily create and share colorful, playful and attractive food-related art and infographics. Add colour and charm to food related images. Use the pictures of food to illustrate charts and graphs. Depict a selection of food and beverages. Create lively and engaging infographics. Use the stylized vector stencil clipart to decorate menus. Food and beverage related vector clipart.